Need help planning your corporate event? Contact one of our corporate event planners at 724-539-1009 to get started. Our event this past Sunday was a HUGE success and we greatly appreciate the support your company provided to us. All of the equipment worked well and your staff was more than courteous. Stevie and Mark represented your company very well. Looking forward to our next event and welcoming them back to join in the fun. By the way the Balloon Artist never sat down, had a line of kids the whole two hours. Since 1991 Windswept Entertainment and Events has been working with companies both large and small to produce incredible corporate events. We have built an extremely diverse inventory over the years that allows us to be a one stop shop. What this means to you is you only have to work with one vendor while planning your event. Over the past 25 years we have gained a vast amount of experience in the corporate event planning field and will use that experience to make sure everyone of our clients have an event that exceeds their expectations. Our goal is to provide our clients with the highest quality party rental equipment while providing unmatched customer service. Whether your company is having a grand opening, a team building event, a company picnic, or the president is coming to give a speech at your location Windswept has the right equipment and experience to make your event a success. We can handle all aspects of your corporate event including outdoor advertisements, signage, entertainment, party rentals, catering, sanitation, and much more. Let us use our corporate event planning experience to help you put on the perfect event. Whether you are planning a grand opening, trade show, or promotional event. Windswept has the staffing and rentals needed to get the job done. Our event planners can help you design the entire event, and since we own are inventory we have complete control over the quality of the equipment and delivery times. Grand openings are when you show your customers and community who you are and what you stand for. It is important that the company you hire to plan your grand opening shares the same values as your company does. At Windswept we believe in providing clean high quality rentals, well spoken and uniformed staffing. Contact one of our corporate event planners today to discuss your event and how we can help. Whether you are holding a trade show at your facility, a convention center, or need to create an outdoor convention space Windswept can help. Our event planners will use our CAD programs to create a floor plan, and supply you with a detailed contract for any rentals you may need such as pipe and drape, tables, chairs, linens, carpeting, and tenting. Windswept produces many promotional events for national companies that are having events at branch locations across the country. Often we provide both the needed rental equipment and the staffing for these types of events, but can also provide the staffing to work with rentals owned by the company. Windswept also has the ability to create custom signage, and tents that can be used for events. 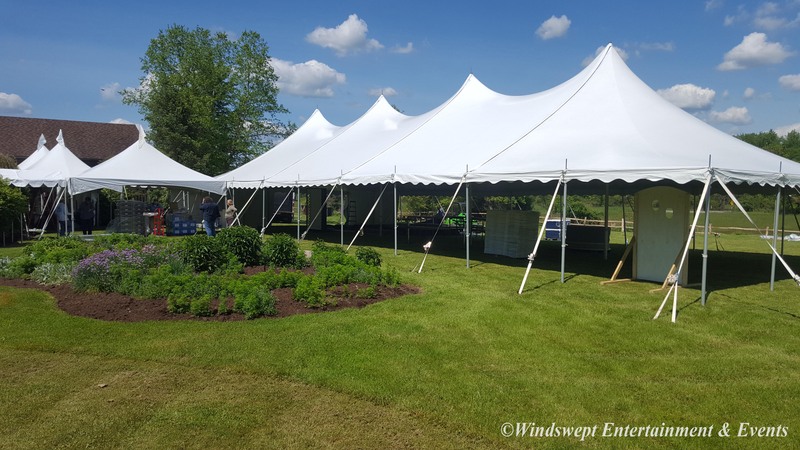 With an entertainment, amusement, party rental, and planning divisions Windswept has everything you need to bring your employee appreciation day to your facility or local park. Many of our corporate customers like this option over going to a public place such as an amusement park because it keeps employees from having to travel long distances. Our planners will work with you to create an event layout, select entertainment, and provide catering options for your event. This 40' x 105' JT structure tent with sunburst gable ends was set up to celebrate Arnold Palmer's 80th birthday and the grand opening of the Spring Hill Suites in Latrobe. Fundraising gala in Ligonier Pa.
50' x 100' SK structure tent rented for a trade show in Johnstown PA.
50' x 120' SK structure tent rented to seat over 1000 people for an employee appreciation day in Johnstown PA.
Over 1,300 employees and family members attended the employee appreciation day. Windswept Party & Event Rentals provided the tents, tables, chairs, entertainment, and catering for the event. These tents were set up for the 150th anniversary of Shady Side hospital. To create enough level space to accommodate the expected crowd a leveled tent floor was installed by Windswept. Our 20' x 30' JT structure tent with clear tops, and blue up lighting created the perfect space for cocktails at the grand opening of the American Museum of Arts in Greensburg.